To say I was a Journey fan growing up is putting it mildly. From the very first Journey concert I went to at age 13 I was hooked. What started out as mild fascination, soon became an obsession. I learned the words to all their songs, bought every teen magazine that even mentioned them, taped radio interviews to listen to over and over, went to more of their concerts, joined the Journey fan club, learned to play their songs on the piano, blasted their music from my room every morning while I got ready for school, and I hung up posters all over my room. By the time I finished junior high, every inch of wall space was covered with something Journey related (and I am not kidding or exaggerating when I say every inch was covered--you can ask my mom). I also fell head over heals in love with lead singer Steve Perry. I swore someday I was going to marry him and be Mrs. Kerrie Perry. I watched MTV as much as possible with the hopes of getting a glimpse of him. The year I graduated from high school,the unthinkable happened; Steve Perry left Journey. I was in shock. And to top it off, the rest of the band planned to keep moving forward as Journey. For me, Steve Perry and Journey were one in the same. You couldn't have one without the other. I grieved the loss, continued to listen to their music and moved on with my life. When I went off to college I met my real future husband (who some might argue looks a little like my favorite lead singer), eventually got married and had a couple of kids. Journey moved on too. After a few years off, they got a new lead singer named Steve.He was ok, but Steve Perry he was not. In my mind my favorite band was a thing of the past and I eventually accepted they were gone. Five years ago I was in WalMart in the electronics department. I heard Journey--old Journey--Steve Perry Journey. I stopped in my tracks and turned toward the wall of t.v. 's where the music was coming from. There, on all the screens, was an Asian-looking singer, but he sounded just like Steve Perry. What I saw did not register with what I heard. I looked away, then looked back and repeated this a few times. The result was the same and I couldn't believe it. 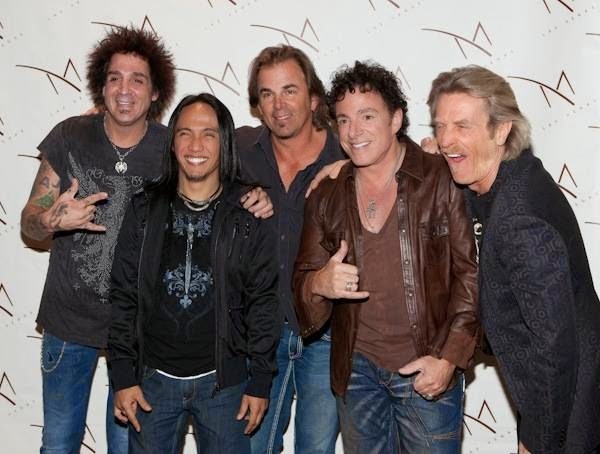 Turns out, this guy, Arnel Pineda from the Philipeans, was the new lead singer for Journey. When Steve #2 left the band, the band turned to YouTube to see if they could find a replacement and after almost giving up, they found Arnel. Even though this new guy sounded just like Steve Perry, I couldn't accept this change. This was not how it used to be, so in my mind, it was not good. I continued to ignore new Journey. I was faithfully a Steve Perry Journey fan and I was sticking to that. But even without my support, Journey's popularity continued to rise and a new generation of teenagers became fans. Last week my brother asked if I had seen the new Journey documentary, Don't Stop Believing; Everyman's Journey, on Netflix about Arnel. He said it was really good and I should watch it. Yesterday, I finally did and I have to say, I have an incredible amount of respect for Arnel Pineda and his journey to Journey. It is a true Cinderella story and I am in awe of his perseverance and of the band's perseverance to keep pushing through all the challenges. Change is hard regardless of where it shows up in our lives. Our favorite band falling apart, children going off to college, friends moving away... Change shakes us at our core and we don't like it. The same thing with our writing. We don't like change. We know there is a part in our novel that is slow and doesn't move the story along, but we can't let it go. We won't change it because it is familiar and comfortable. It doesn't mean it is good, it just means we know there is work involved with changing it. The sooner we can accept that change is a part of life and a necessary part of our writing, we can move forward, do the work and reap the benefits sooner. When we hold tight to the familiar and don't embrace change, we get stuck and miss out on some amazing opportunities to grow. This past summer Arnel Journey came to the area for a concert. People asked if I was going and of course I said, no. I was still holding on to my allegiance to Steve Perry, refusing to accept this new change. Because of my stubbornness, I missed out on a good concert. But I can assure you, if new Journey comes back to the area next summer, I will be first in line for tickets. It is time to accept this change with open arms. Change is inevitable, and we might as well embrace and accept so we don't get left behind. The changes in today's publishing and social media worlds are a good example. Awesome post about change. If you have watched the documentary, you would come to admire Arnel. His songs reflect his life. DSB! To top all that he remains humble amidst his success and worldwide fame. So true. The changes in the publishing arena are huge and I think if people fight them and hold on to the past they will be left behind.